Sponsors and partners are invaluable to organisations, far beyond the monetary investment they bring. The right sponsorship partner can accelerate your organisation to the next level. Until now, there has been very little information that is valuable and useful for this specialised area of business development. Individuals who are charged with bringing in sponsors and corporate partners need a training resource that is both practical and detailed. Finally, Richard Woodward has provided How to Attract and Retain Sponsors and Partners. This book combines his knowledge and experience from both sides of the sponsorship fence with his insights as a business development trainer to create an invaluable asset that crystalises the multifaceted steps into a clear, repeatable process. This book is essential reading if you’re a corporate partnership manager, sponsorship manager, business development manager or development manager working in arts, culture, sports, charity, health, environment, association and events sectors and you’re tasked with securing corporate partners and sponsors and managing those relationships. It is also a must-read for CEOs looking to develop an effective partnerships team. If your organisation has no clear plan in place to secure and retain corporate partners, you’re not clear on what your organisation can offer a corporate partner, your team struggles to secure first meetings, and your conversion rate is unsatisfactory, it’s time you read this book. It also covers what to do when your existing corporate partners are demanding too much and not renewing, so that you can change up what you do with a new, methodical approach to implement. This book will be an invaluable resource for your team to refer to throughout their day, when making sales calls and first contact with prospects, preparing for meetings and crafting the all-important proposal. It can be used again and again, to develop and grow fruitful relationships with sponsors and partners that will endure for years to come. How to Attract and Retain Sponsors and Partners is a step-by-step business development process based on Richard’s 30 years’ experience working with and training leading organisations on both sides of partnerships across all sectors. Filled with highly practical advice that’s delivered in an easy-to-digest full colour format, this book reveals the templates and language that has been applied to real world business relationships that have resulted in millions of dollars of investment. With checklists, worksheets and practical exercises at the end of each chapter, How to Attract and Retain Sponsors and Partners is designed to enable you to immediately apply the concepts and reap the rewards. It will prove an invaluable resource for your organisation for years to come. To be successful at attracting sponsors and corporate partners you need a deep understanding of corporate objectives and the role of sponsorships plays in helping corporates achieve these objectives, plus the business development skills to successfully engage with corporates. Once again Richard demonstrates his vast knowledge of sponsorship through a well presented and thought-out book. He has delivered a practical guide for sponsorship seekers that gives clear and actionable tactics that readers can apply to their businesses. Richard worked as National Sponsorship Manager at Commonwealth Bank and Marketing Manager at KPMG and, on the rights holder side, as Sponsorship Manager at Sydney Opera House and Marketing Manager at Stadium Australia. In these roles he managed sponsorships ranging from cricket and netball to ballet, festivals and community events. Richard is seasoned business development trainer and author of Business Development That Works, his insights on effective business development will give you the required business development techniques to successfully attract and retain corporates. Over the past 14 years, Richard has developed strategies and provided training and coaching to multiple sectors that seek sponsorship. He has worked with leading players in the worlds of arts, culture, sports, charities, events, music, environment, health and education as well as national and multinational corporations. He shares insights from the trenches working with hundreds of business developers on what works and what does not. Since 2004, Richard’s workshop How to Attract and Retain Sponsors and Partners has tested the materials solidified in this book with top sponsorship seekers from a variety of sectors. Richard’s expertise has been widely recognised; he’s a popular speaker on sponsorships and partnerships, asked to speak at events again and again, including the Australian Sponsorship Marketing Association/Sponsorship Australasia conference on seven occasions, the Fundraising Institute of Australia (FIA) Conference on five occasions, plus the Culture Business Conference in Sydney and Melbourne, Communicating the Museum in Paris, Audi Marketing & Corporate Communications Conference, Sponsorship News Conference, Associations Forum National Conference, International Not for Profit Convention & Exhibition (INCE), Professional Conference Organisers Association Conference, Asia Pacific Association Executives Congress (APAEC), Fundraising Institute of New Zealand (FINZ) Conference, Australian Business Events Expo (ABEE), Australian Events Symposium, Meetings & Events Australia (MEA) National Conference, Exhibitions and Events Association (EEA) Annual Conference and Events Queensland Regional Events Conference. Plus, during his time at the Commonwealth Bank, the Bank won the Australian Financial Review National Sponsorship Award in the sport category. This book is the B.D. bible for all people working in business development with sponsors and partners. This is a bible to keep by you at all times. Before I got my own copy, I was forever borrowing my colleagues!" This book is invaluable for moving from business development to strategic corporate partnership development by bringing all the key components of the partnership lifecycle together. A living reference point I refer to weekly. Step by step guide suitable for beginners to experienced BD professionals. 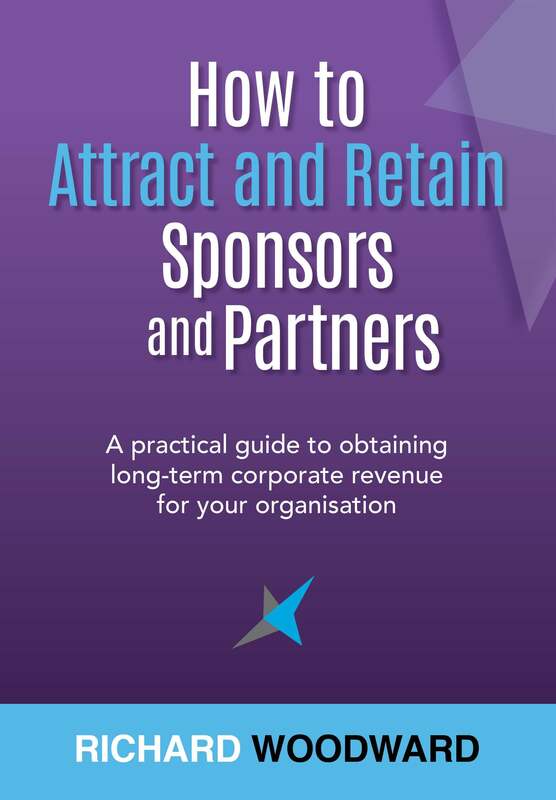 Understand the attitude, skills and knowledge of effective sponsorship seekers so that you can adopt these characteristics for a successful outcome, plus the ten reasons why most organisations fail to attract corporate partners – so you can avoid these. This first chapter reveals the key questions to address in your sponsorship strategy, plus the nine invaluable things sponsors give you, besides money, that represent massive value to your organisation. Look at sponsorship from the sponsor’s perspective – when you understand what sponsors are looking for you can better develop proposals that invoke “yes!” Discover what business objectives can be nailed through sponsorship and understand how sponsorship is a powerful marketing and business development tool. Discover how to construct a compelling proposition and avoid the crucial mistakes that unsuccessful seekers make. This chapter includes a fantastic template to develop your proposition to use over and over again. Plus, we look at the seven tasks you need to undertake to determine what your organisation has to offer and the essential information you need to include about your audiences and communication channels. We also examine different types of sponsorship properties and how to determine which to concentrate on. Slash the time wasted debating your sponsorship and partnership valuation with this simple, six step approach for determining the value of your sponsorships, plus the seven essential considerations on how and when to present your price. Chapter five focuses on how to identify and maintain a flow of qualified prospects that are particularly suited to your sponsor and partnership proposition, plus how to develop a sound business development activity plan to achieve your targets. Your all-important approach can be complicated and compromised by nerves, indecision or lack of confidence. Explore the five different ways to approach a prospect with confidence, restructuring phone calls and emails with prospects so that they’ll be keen to meet. We delve into the exact language of your approach that will dramatically impact your success and how to provide a compelling summary of your partnership opportunity in just one page. Make yourself and your organisation compelling to prospects so that they’ll rush to approach you. Attraction marketing techniques are all about putting you and your organisation in front of prospects so that your organisation looks highly desirable. Too many first meetings are wasted – grasp this opportunity through a thorough, methodical preparation that will ensure these meetings are efficient and profitable. Cultivate rapport with this systematic approach to interpersonal skills – essential for effective business development. Your increased ability to build rapport with a wide variety of key stakeholder personalities will have a noticeable impact on your ability to secure new sponsors, partnership retention and recurring revenue for your organisation. Conversion rates will dramatic increase after you learn how to ask better questions to uncover the underlying, deeper needs of your prospect. Discover Richard’s widely renowned questioning and listening methodology which he teaches at his popular public workshops and uses with clients and prospects to enable you to exponentially accelerate your close rate. Chapter 12 reveals a highly effective questioning technique that explores solutions, together with your prospect, so that you can create a compelling proposal that leads to an inevitable “yes”! Chapter 13 shows how to structure a winning proposal. We examine five different visual aid options when selling to corporate partners and the difference between key facts documents, opportunity documents and proposals. Including invaluable proposal and presentation checklists, this chapter is like having Richard by your side, structuring and reviewing your proposal. No doubt, this is a chapter you’ll return to again and again. Learning how to build commitment throughout the relationship with your prospect and read buying signals will mean that you never again be unsure of how a prospect will respond when you adopt this approach. As you are far more collaborative, you’re able to recalibrate your approach and respond accordingly as the relationship evolves. Chapter 14 reveals five techniques for provoking action from your prospect, plus a five step approach for gracefully overcoming common objections such as “there’s not enough return on investment” and “we don’t have any budget”. All the hard work you do to secure a partner or sponsor is wasted when they don’t renew. We examine the mindset, tools and techniques needed to effectively manage and service sponsor relationships, which Richard has used, taught and coached many people to use. We look at how to develop a Partnership Implementation Plan and run a Corporate Partners' Workshop that keep your partners enthused, motivated, and renewing. Seeking sponsorships and corporate partners is a long sales cycle so keeping your attitude buoyant is crucial. Learn seven techniques for creating and maintaining a positive attitude, plus practical ways to boost your team’s performance and keep up morale. Regardless of the size of your organisation, your resources, team or objectives, attracting and retaining sponsors and corporate partners is just as possible, and can be a game-changer. Learn what you can do to impress your prospective sponsors, whatever the size of your organisation. 280 full-colour pages, bursting with practical ideas.